Are you kidding me? That doesn't if look real it is soooooo awesome! Wow Gail!! Your "ice" series is going to be fabulous!!! ..beauty... makes me want to bite in it! well, there is one word for that . . . WOW! you get the coolest pictures! The contrast of the deep indigo and the richness of the rusts, all sugared- yes. 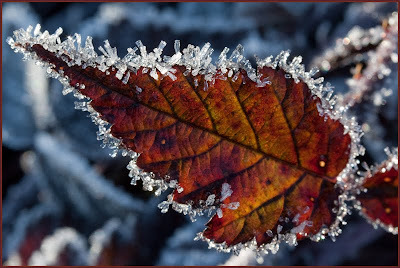 what a perfectly perfect frosty leaf. i really enjoy your wordless wednesdays.. always something so beautiful. you have a great eye. nature, you couldn't make anything so beautiful. Isn't that the prettiest photograph? Thank you for sharing!